Choose Shipping Service: Select...Standard Shipping to U.S.Priority 2-3 Day Shipping to U.S. Glowing, lurching, growling and doing it all with a really bad attitude! He won't rest until he's walked all over you! Each Ghoulsville Vac-tastic Plastic Mask measures approximately 23" high x 17" wide and 4" deep, has diecut eyes and weighs roughly 18 ounces. This Ben Cooper-style mask wall hanging is not flat -- it is just like the old masks with eyes cut out with a 3-D look! Content of mask is vac-form plastic including an attached cardboard backer with a single 2" diameter cut out hole for easy hanging. Display box measures 24" high x 18" wide x 4" deep & has clear plastic window making it a terrific package to display. Purchasing Instructions: No foreign orders for this item. You must choose your desired shipping service at the drop-down menu above, and it must be the same service you select in the shopping cart. Due to the large size of this item and its shipping carton, USPS adds a DIM Wt. surcharge which will be added to the price for this item. Standard shipping does not have this surcharge. 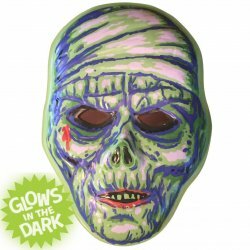 Glow-in-the-Dark Mummy is from the Ghoulsville Series 2. COLLECT THEM ALL!